For the buns, stir the water, yeast and sugar together to activate the yeast. You can tell when the yeast is activated-little bubbles will have formed, which will take several minutes. Add the melted butter and 3 of the eggs and mix until incorporated. Add 4 cups of flour and the salt to the bowl of a stand mixer fitted with the dough hook attachment. Mix together on low speed, then stop and add the wet ingredients. Continue to mix until the dough is very smooth, about 5 minutes. You may want to add a little bit more flour as you mix; the dough should be sticky but workable. Transfer the dough to a bowl. Cover the bowl with a kitchen towel, place in a warm area and let rise until the dough has doubled in size, about 30 minutes. After the dough has proofed (risen), turn it out onto a lightly-floured countertop and knead in the cheddar and black pepper. Try not to overwork the dough; once the cheese is mixed in you can stop. 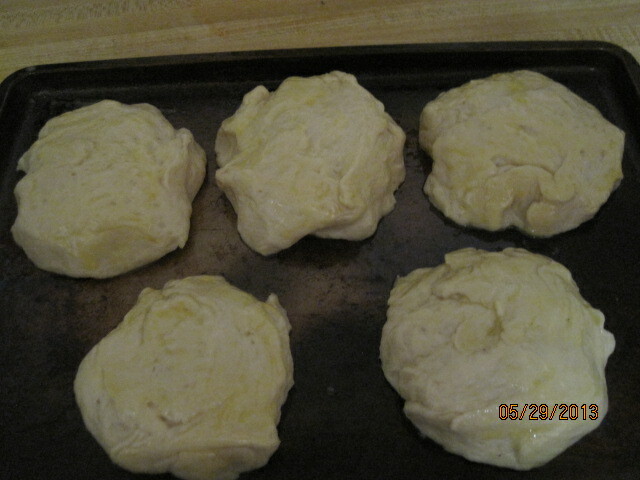 Cut the dough into 6 equal portions and shape them into round balls. Place on a buttered baking sheet and flatten them with your hand. Cover and let rise again in a warm area until they have doubled in size, about 30 minutes more. When they are almost doubled in size, preheat the oven to 350°. Beat the remaining egg in a small bowl and brush the tops of the rolls with the egg. 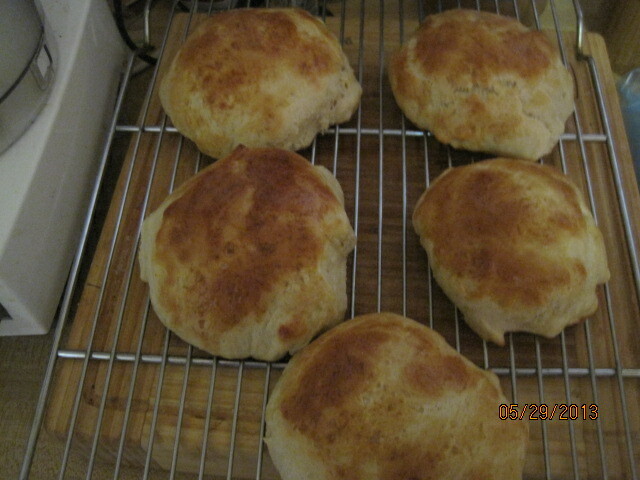 Bake until golden brown, rotating halfway through, about 10 to 15 minutes.Cool the rolls on a wire rack. For the ketchup, turn the oven down to 250°. Cut the garlic in half crosswise and sprinkle with olive oil, salt and pepper. Wrap the garlic in aluminum foil and roast until soft, about 35 to 40 minutes. Remove the garlic from the skins and mix into a paste. 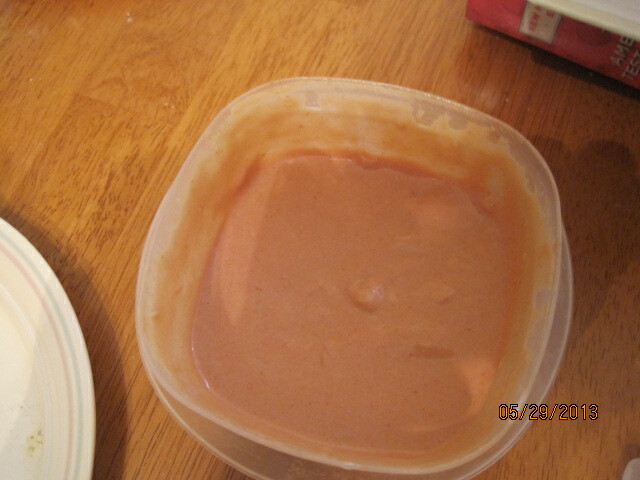 Reserve 1 tablespoon for the ketchup, and keep the remaining garlic for another use. Whisk together the mayonnaise, mustard and roasted garlic in a bowl. Add the ketchup and vodka and mix until incorporated. This will keep for up to 6 days in the refrigerator. For cooking the burgers, heat a skillet over high heat or heat an outdoor grill to high. Sprinkle the patties with salt and pepper. Coat with oil and sear or grill until medium rare, about 3 to 5 minutes per side. Slice the buns in half horizontally and brush with the melted butter. Toast in the skillet or on the grill. Arrange pickles slices on each bottom bun and place a hamburger on top. Slather 1 to 2 tablespoons of spiked ketchup over the burger and set the top bun in place. Serve with the remaining ketchup on the side. Just a few things about this recipe. Number one, I’ve never made any type of buns like this before so it was a new experiment for me. I have to say it was pretty easily done and they came out quite nice. I did eliminate putting the cheddarr and black pepper into the rolls because I wasn’t sure how they would come out and wanted to try them just plain the first time around. We all liked the hamburger buns better than anything you would buy at the supermarket. As is noted in the recipe, however, the recipes for the buns and the ketchup are quite large. The buns themselves come out big when they are finished and are probably more than what you need for a hamburger unless you really like a large roll. I actually ended up cutting the recipes for the buns and the ketchup in half of what is shown here and still ended up with a lot of ketchup and big buns. Next time, I think I will portion the buns out to make them even smaller and see how they come out and maybe even just do 1/3 of the ketchup recipe. You could go for completely homemade in this recipe and grind your own beef with a mixture of chuck and sirloin and form your own patties that way. Of course, you can serve any condiments or sauces that you like on the side. We actually made ours with some crispy bacon and some onion rings. That’s the recipe for today. Check back next time and you can see the meatloaf recipe I tried out recently that comes from Tyler Florence. I also have a few other recipes for the coming days and weeks so you want to keep checking back and see what comes up. Until then, try to stay: this heat wave were experiencing in New York and enjoy the rest of your day and enjoy your meal! I love making ribs of all kinds no matter what time of year it is, but as the summer approaches it gets to be more and more the type of thing that people want to cook on the grill. Unfortunately, living in a condominium here in New York limits the grilling that we can do since we can’t have a charcoal or gas grill here. This means that I have to try to find ways to do this type of cooking indoors. I am always on the lookout for new recipes for ways to make spare ribs or baby back ribs (which are my personal favorite) and I came across this one from Williams-Sonoma on their website so I thought I would give it a try. Preheat the oven to 350°. Cut each rib rack into 2 or 3 sections. Mix together the salt, paprika, oregano, thyme, granulated garlic, onion powder and pepper. Sprinkle the mixture on both sides of the ribs and rub it into the meat. Arrange the ribs, overlapping slightly if necessary, in a large roasting pan. Cover the pan tightly with aluminum foil, place in the oven and cook for 30 minutes. Remove the foil, turn the ribs and return them to the oven. Continue cooking until the ribs are tender and browned, about 30 minutes more. Meanwhile, make the sauce. In a small saucepan, stir together the chili sauce, peach preserves, molasses, vinegar, mustard and hot pepper sauce and bring to a simmer over medium-low heat. Remove from the heat and set aside. If you are you using a grill, prepare the grill for direct-heat cooking over medium-high heat. Lightly oil the cooking grate. Brush both sides of the ribs with the sauce. Place on the grill, cover and cook, turning once, until shiny and glazed, about 3 minutes per side. Alternatively, if you are planning to use the oven, increase the oven temperature to 425°. Pour off the fat in the roasting pan, then return the ribs to the pan. Brush the ribs with some of the sauce and cook until the ribs are shiny and glazed, about 5 minutes. 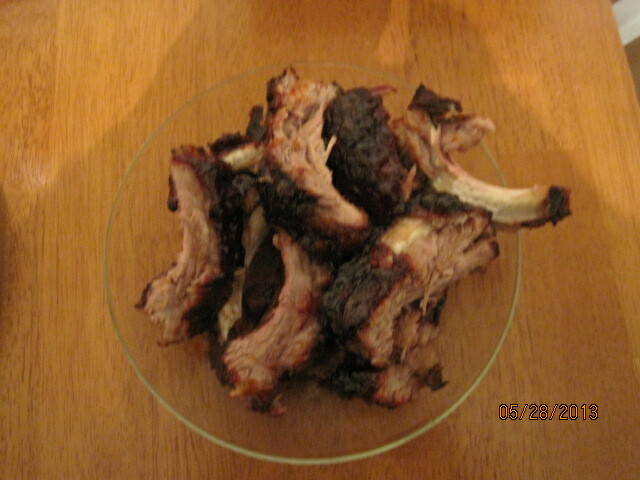 Turn, brush the ribs with more of the sauce and cook to glaze the other side, about 5 minutes more. Transfer the ribs to a carving board and let stand for 5 minutes. Cut between the bones into individual ribs, heap on a platter and serve with any of the remaining sauce. You could easily use spare ribs for this recipe instead of the baby back ribs. Just keep in mind that the spare ribs tend to be larger and a little tougher than the baby back ribs so they will take more time to cook. You should allow for about 45 minutes of covered baking, another 45 minutes uncovered and then 15 minutes after you put the sauce on for glazing. I think they came out great cooked just in the oven but if you have the opportunity to put them on the grill after starting them in the oven I think you could get nice flavor from that as well. I like the glaze and the combination of the apricot preserves (which is what I had on hand), the chili sauce, the mustard and the hot pepper sauce. It made a nice combination and gave a great flavor to the ribs. I served this with sweet potatoes and corn on the cob, although you could easily do it with coleslaw and potato salad, which go great with things like ribs. That’s all there is for today. Check back again next time and see which recipes that I will post. 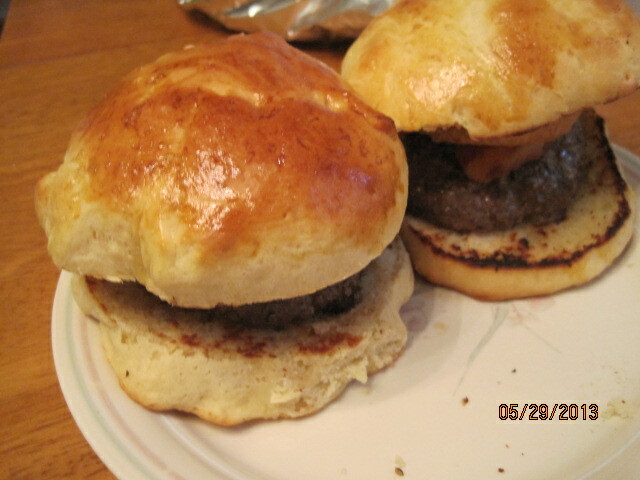 I tried a new method for burgers yesterday and made my own homemade hamburger rolls and a special ketchup, both recipes that I got from Marc Murphy, and I think they turned out great. Check in next time and I’ll be posting those recipes. I am also planning a few other things for the coming days and weeks so you want to keep checking back and see what comes along. Until then, enjoy the rest of your day and enjoy your meal! Everyone, and I mean everyone, always loves the cookies Michelle makes. This is particularly true of the chocolate chip cookies she makes and the oatmeal raisin cookies. I love the both myself, but I have to admit the oatmeal raisins are my favorite. They come out perfectly and I am pretty sure I could eat an entire batch of them myself if I put my mind to it. What’s her secret recipe? Well, it’s hardly a secret really. She uses the same recipe as is listed on Quaker Oats’ website for their cookies, but she does tweak it a little. Preheat the oven to 350 degrees. Beat together the butter and both of the sugars until creamy. Add the eggs and vanilla extract; beat well. Combine the flour, baking soda, cinnamon and salt in a separate bowl and mix well. Add the combined flour mixture to the butter mixture and mix well. Slowly stir in the oats until just combined.Fold in the raisins until just combined. Drop rounded teaspoons of cookie dough onto cookie sheets lined with parchment paper. Bake the cookies for 10 to 12 minutes or until golden brown. Cool for 1 minute on the cookie sheet and then remove to a wire rack for further cooling. That’s all there is to them. The only changes she really makes are in the oats and raisins. She uses the Irish oatmeal a lot of the time. It seems to have a more natural and better flavor than from the standard Quaker Oats we have bought in the past and I really like them this way. She also adds in twice the amount of raisins as is in the standard recipe. This seems to make the cookies softer and more chewy, which is great in an oatmeal raisin cookie. As I said, everyone really seems to enjoy them, and she just made them this weekend and we devoured them at every chance, almost as quick as they were coming out of the oven. I had to stop and make a plate just to be sure I could get a picture of them before they all disappeared. That’s the recipe for today. Check back later in the week and I’ll have a few more recipes, including a little different take on baby back ribs that I made last night, a new chicken recipe and even some burger recipes I want to try. I have a few others in store for the coming weeks as well that should be great that I have picked up from various sources, including The New York Times, Food Republic, Alton Brown, Marc Murphy, Bon Appetit and many more. Keep checking back to see how they work out. Enjoy the rest of your spring day today and enjoy your meal! We’ve done a lot of cooking and baking over the last few days, and it has given me quite a few recipes to work with. 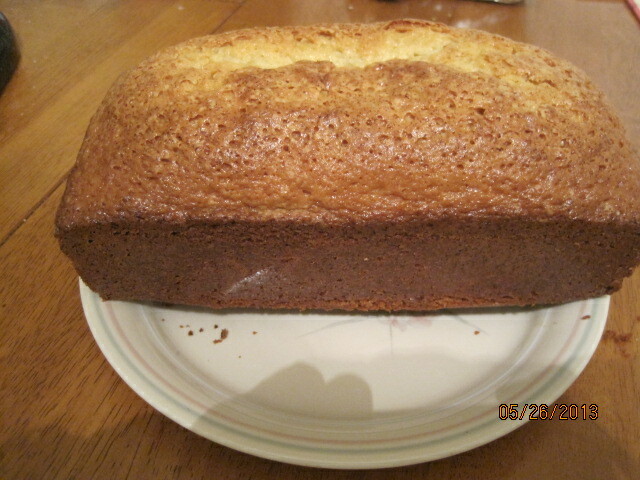 One of the things we made this past weekend was a classic pound cake recipe that I got from America’s Test Kitchen. I love just a plain piece of pound cake with a cup of coffee or maybe even a simple dollop of whipped cream or a little bit of fruit on the side. It’s a great thing to make it and doesn’t take a lot of work on your part so you could easily make one and bring it to a party or a friend’s home. Adjust an oven rack to the middle position and heat the oven to 350°. Lightly coat a 9 x 5-inch loaf pan with vegetable oil spray, then line the bottom with parchment paper. Whisk the flour, baking powder, and salt together in a large bowl and set aside. Process the sugar, eggs, and vanilla in a food processor until combined, about 10 seconds. With the machine running, pour the melted butter through the feed tube in a steady stream, about 30 seconds. Pour the mixture into a large bowl. Sift one-third of the flour mixture over the egg mixture and whisk in. A few streaks of flour should remain. Repeat twice more with the remaining flour mixture and continue to whisk the batter gently until most of the lumps are gone. Do not over mix. Pour the batter into the prepared pan and smooth the top. Wipe any drops of batter off the sides of the pan. Bake until a wooden skewer inserted into the center of the cake comes out with just a few crumbs attached, about 50 to 60 minutes, rotating the pan halfway through baking. Let the cake cool in the pan for 10 minutes, then flip it out onto a wire rack. 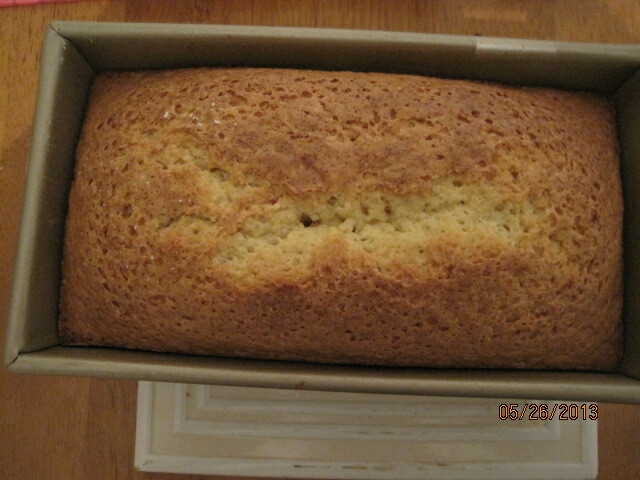 Turn the cake right side up, remove the parchment paper, and allow it to cool to room temperature, about 3 hours. There are few notes about this recipe. You could easily vary the recipe up a little bit and add some flavor to it. Adding 2 tablespoons of grated lemon zest and 2 teaspoons of fresh lemon juice to the sugar just before you process everything in the 2nd step will give you a nice lemon pound cake. You can do the same with a tablespoon of grated orange zest and a tablespoon of orange juice and get an orange flavor instead. If you don’t have any cake flour on hand, you can make your own replacement. For every 1 cup of cake flour, you need 7/8 of a cup of all-purpose flour and 2 tablespoons of cornstarch in order to get the same results You can serve this cake with a variety of different fruits on the side or some homemade whipped cream. Remember that blueberry sauce I made about a week ago? I used that on the cake and it tasted great. That’s all there is for today. 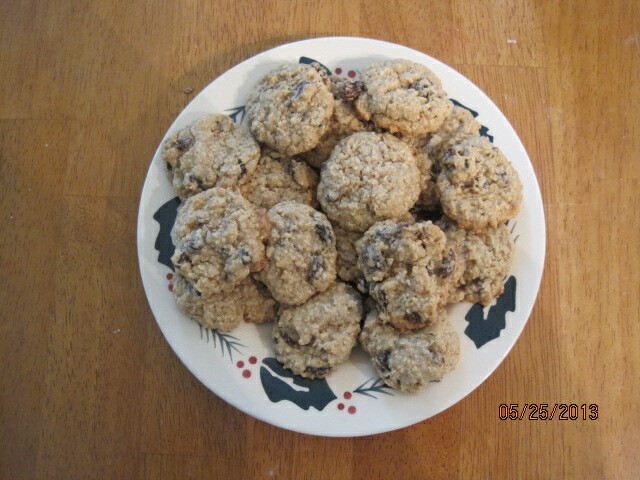 Next time out I held be sharing the recipe Michelle uses for her oatmeal raisin cookies. 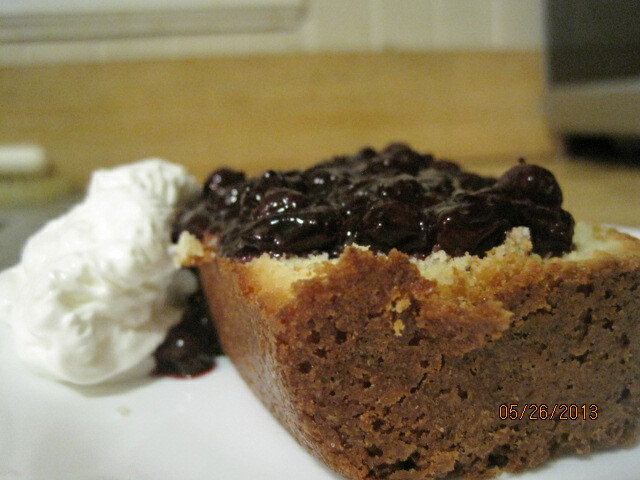 I also have some other recipes to try to share this week so keep checking back to see if there’s anything you like. Until then, enjoy the rest of your day and enjoy your meal! Best Burger Recipes: Classic, Sliders, Lamb, Bison & More : Cooking Channel. And because you can never have enough burger recipes to use for the summer, the Cooking Channel also posted 50 burger recipes that you can use. Some of these look pretty awesome and they are not all beef so you can find something you like even if you want to cook meatless burgers. Check it out! Recipe of the Day: What to Cook in May 2013 : Recipes and Cooking : Food Network. Here’s some more great grilling ideas from Food Network if you are still looking for something to make today or use them anytime this summer when you want to grill. Check it out! Best Burger Recipes : Recipes and Cooking : Food Network. If you are still looking for some great burger ideas to use on the grill today, Food Network has these 50 burger recipes that can fill all your needs. There’s nothing like a good burger so you are sure to find a recipe you like on this list. Check it out!